IDIYA sits at Broad and Washington in the middle of the Broadmoor neighbourhood, in the heart of New Orléans. Sandwiched between Central and Mid-City, it’s dead-centre for the entire region – good, because the patience of NOLA commuters is not infinite. That was one factor behind the disappearance of the older space, GumboLabs. The big glass storefront has the gallery on the one side, by the entrance, and the office desk far to the other wall. Between them, the black piping and lacquered wood of the central workbenches, clean, mostly clear, and ready for any of the 60 or so members to use! With the benefit of a generous landlord, the environs of IDIYA are prime expansion room, and already the backyard has been turned into a bit of a sculpture garden. In addition to the original shop space, they’re also setting up the building next door as a woodshop (which was freshly painted right before my visit), and then they’re putting up a metal shop behind that, in a quintessential Louisiana steel shed that looks to need some cleaning first. In the main building, there’s the obligatory general-purpose laser cutter and 3D printer bank (including a CubePro Trio that has never worked), but the most fascinating piece of equipment they have is a huge cartesian 3D scanner which can do a full-body scan in just 20 seconds, perfect for fashion designs! The central workshop is open, dominated by long, standing-height desks with gantries holding lights and equipment. Stage lighting bounces off the walls and ceilings, giving it a hip, studio feel. Scattered in the centre of the space are various projects, like the quadcopter hanging up on a post. There’s a CNC mill that’s totally encapsulated in an anti-dust tomb, freshly blackened from a session with a block of graphite. A 40-watt laser cutter sits at the heart of the main workshop, ready to chew up custom swatches of fabric. A pair of classic sewing machines and mannequins sit next to the vinyl cutter, rounding out the machinery for bespoke clothes. IDIYA is not shy of commerce, being a for-profit shop. It’s been a launchpad for entrepreneurs, and has itself managed to net a few design and modelling jobs away from the professionals at places like Entrescan. The other thing that sets IDIYA apart is that it’s a real school! A homeschool alliance meets at the space, with a sui generis STEAM curriculum. I can just hear the Phoebes now: “At my old school, we would make own own on the computer…” What an engaging, fun place to be able to learn! Starting west from downtown at 4pm, Katy may as well be in New Mexico. It’s about as exurban as you can get, complete with that malfunctional artery, IH10, for which no combination of lanes, tolling and HOV seems to abate the 5pm infarction. Traffic is terrible all over Houston, but this is plainly the worst of it, with too much distance to cover and hardly any parallel surface streets. Rather than dash way into town all the time, the creative types around here need a place of their own. Hence, Katy Makerspace. Today, they’re turning up their new plastic extruder, made in the Lyman/Mulier [link] fashion, with an old RAMPS board inside. The beads of natural PLA come out clear to slightly brownish from the nozzle, making cobra-like swirls on the desk. A little leaks out the sides, smelling vaguely sweet as it caramelizes on the exposed brass. They’ve fixed all but two main problems: The diameter sensor wigs out in the harsh sunlight streaming in through the open garage door; Okay, run it in the shade instead. The thermistor is also under-reading, which makes the heater coil melt the plastic well above the semi-solid temperature where it could be pulled sideways and wound onto the spool. Just setting the temperature lower doesn’t work because of the stock RAMPS software, which kills the extruder motor below a certain temperature (in a 3D printer, the motor can burn out trying to push jammed plastic). So the next step is to drill another hole in the project case so they can plug in the USB port and change that setting or the thermistor settings. One member, a gemological expert, who fills me in a little on how the ancients cut sharp facets in gems using little more than spinning discs and sticks, plans to use another similar extruder to spin over a tonne of glittering clear plastic beads, half PLA, half ABS, into print-quality spools costing about half what you’d pay at MicroCenter, perhaps with an additional discount for the non-profit spaces. The work stretches late into the evening; takeout is Domino’s, and the preferred beverage is beer – did you know Shiner Bock comes from Texas? KatyMS has about 30 members, the most active of which are in just about each weekend. Those usual suspects include one one of the folks responsible for making the BuildYourCNC kits, which are beautifully custom-milled out of sturdy, water-resistant sheets of MDO – one such unit sits in the back of this shop! Another member runs back and forth trying to fix up the power supply on the FlashForge 3D Printer, swapping it out with a nearly identical unit from home for the time being. The leader of the space is a computer jockey, who brought in spare equipment like the rackmount and copier. Datawise this place is rigged out better than any place I’ve seen since Dallas, each wall lined with computer workstations; Internet by cable modem at the moment. A custom website checks members in and out. They’re really keen on getting more of the region’s makerspace leaders together for some sort of council or convention, and like 10BitWorks, interested in doing a tour among nearby spaces. Katy Makerspace is definitely an active, industrious shop, punching well above its size. Well worth the trip! The oldest, largest space in Houston is a sprawling complex in an industrial area. It’s a bit northeast of downtown, with plenty of street parking, just down the way from the Champ Burger. TX/RX Labs hosts numerous classes and events, on top of two weekly open houses. With a lot of ground to cover, the tour takes about an hour now, depending on the curiosity of the visitors. Friday night is clearly the bigger night for tours, as the toqued tour guide shows off the 3D Printers (FDM and Resin! ), Laser Cutters (3 of them! ), Electronics Lab (including a pick-and-place! ), Metal Shop (Plasma and Water Cutters! 5-Axis Mill! ), Ceramics Studio, the Artist Space, and the Classroom/Computer Lab. The Woodshop is in use, a gaggle of folks all learning how to make the same thing; walking past, we get a timely plug for the TX/RX classes – in exchange for the course fee, you get something cool to take home, and signed off on using the equipment. Anyone can take a class here, though Members get a slight discount. You can also “test out” on the machines, when the staff shop managers set aside time for that. The space has a real focus on safety and certification; the space has a badge system to keep track of who is trained on what, and there’s a monthly shop meeting where they focus on safety and what else is up. You can hardly see the whole thing in one go; with full daylight on Sunday morning, you can see the courtyard (stocked with project motorbikes and ISO Storage Containers), a newer building (under construction, but already being used as a podcasting studio), plus a glimpse at the Woodshop, which has a massive ventilation fan at the ready, along with a SawStop Table Saw and a CNC mill that could easily take a full sheet of plywood, and vacuum up after itself in the process. Up close, the plastic Vacuum Former looks ready to outfit an army of Stormtroopers with body armour! The real heart of the whole space is the full kitchen, featuring water-cut granite tops with matching black refrigerator, an ensemble that looks right out of a model unit from the home improvement store, with some parts made in-house! Meals are timed along with the Open Houses; Friday Dinner happened shortly before my visit; by the end of the tour, its remains are down to a bit of salad and tortilla chips, though the main course was clearly fried in the wok on the gas-fired stovetop. The $5 Sunday Breakfast at TX/RX proves to be scrambled eggs, American fries, strips of side bacon, Belgian waffles with butter and syrup, a pick through a plastic-binned fruit platter of cantaloupe, honeydew, pineapple, and red grapes, plus whole and juiced oranges. The coffee station is tucked away in the kitchen, behind the busy wafflemaker. The members grab quick plates and get to work, leaving the talkative visitors with the occasional blind-leading-the-blind experience as different new folks saunter up in small groups. With the diverse characters and varied conversation – it’s like an old-school hotel parlour! The dinner table itself is constructed of matte-black steel and smooth-formed concrete, all fashioned right here – the same type of shelving that you can rent by the half-or-full bench, if you want to take the step up from your basic monthly membership. Those benches now fill the north side of the main building, and a few are trickling into the side buildings now. The artist building’s tables are built at nearly the same height, but built out of mercifully softer 2x4s and laminated plywood. Wherever possible, TX/RX does it itself. The space is almost entirely member-funded, but it does have some paid staff, mainly to keep the machines running. The dues end up being a little more than average, but it’s still cheaper than TechShop on its best month. All the other shops in Houston have a little of this and that, but TX/RX is the only one that has this huge breadth of tooling. If nothing else, come for the food and chatter! CreatorSpace is on the southeast side of Houston – Webster, to be specific, the same side of town the Johnson Space Center, and the big museum where they just opened the static display of the fake Shuttle Independence atop a real 747 Shuttle Carrier. If you’re inclined to brave the traffic on the Gulf Freeway to rubberneck at all the NASA or just want to work around a fun crew of talented creators and engineers, swing by and pay a visit one of these Tuesdays! With a signed waiver, the short tour winds through the rest of the three-chambered slice of business park, pointing out the cool tools, almost all of which is in flux! The vinyl cutter is finally getting a dedicated console computer, the Laser is getting upgraded soon, and there’s more than a couple 3D Printers in various stages of development, but the sturdiest-looking one is set aside behind today’s big project, the CNC mill. This is a CNC with some history to it. It’s a donation, originally built from an old 90s kit – it’s not even running on steppers, it’s servo-based. The whole controller has long since become obsolete [the previous console bore the Packard Bell brand]. Swirls of cabling underneath have been rerouted to a more modern system running LinuxCNC. It’s been a long haul, but the beast is finally moving on two out of three axes. Both ends of each axis have switched endstops, which is getting to be less common with light-duty mills these days. What’s really different is that both switches on the same axis trigger the same fault input on the mill. On your average RAMPS board, the one-size-fits-all of modern computer stepper control, if you even bothered with double-endstops, you’d have six switches running to six different inputs. The other current development is a new Raspberry Pi-based security camera, running off a custom Pi distribution, which uses the RPi add-on camera and a web interface to provide all your checkboxes for a monitoring solution – motion detect, recordings, and remote access. The framerate is pretty good, even for streaming over wireless. It’s just a board-level hack at this point, not so much as a board and zipties holding all the moving bits of the project into a unified mass. When everything’s finally tapped down, it’ll probably be connected by Ethernet to the space’s network switch, so bandwidth or interference won’t be any worry. They’re not afraid to jury-rig; Cutting the wall open isn’t an option, so a window-mount air-conditioner sits in the middle of the space, the back side of it connected to the outside air with a tape-and-polyfoam duct. It’s nifty, but it also doesn’t quite work right. Another hack: one member’s radio-controlled hex-rover, locally re-engineered from online plans. As long as you’re messing around, why not do six wheels instead of four? Oh, and did I mention they’re building a blimp? The resident quadcopter expert has a two-fan gondola ready to go! Many of the machines and tooling in the space are on loan from a particular member, typically mentioned by sharpie on masking tape. CS also uses a handy colour-coded system of electrical tape X-marks, that lets you know whether a particular thing is in good repair and whether it’s free to use or not. The same codes of tape apply to stored items, and disused machinery. It’s intuitive; you can guess what a red X would mean if you suddenly found it on your giant killbot from last year. The next thing on the way out is a big ceramic kiln, they could only power two or the three heater coils off the current power system anyway. Not to be overlooked, the space does a little bit of educational outreach, they wipe and rejigger old, donated computers and put them to use again at schools and other worthy recipients. At least one teacher has paid a visit to get some ideas on integrating the digital manufacturing revolution into the curriculum. The first and last thing you see walking in is the big front desk, also host to the weekly membership meetings (latest news: the space’s favourite colour is blue! ), and conveniently near the beer fridge! The big story today, stretching late into the night, is one member’s vacation to the farthest reaches of the Al-Can Highway, tracking ice roads up in an all-wheel-drive Subaru, wild! The CreatorSpace banner has officially been waved everywhere from the Gulf to the Arctic. Next stop: OuterSpace? 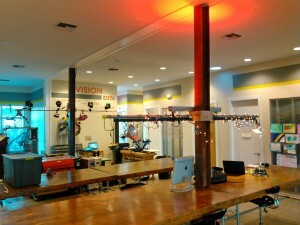 Houston Makerspace has about three regular events each month. Without many windows to look into this universe of greenery and applied art, Maker Market Saturday seemed a good way to spend an afternoon and see what they’re all about. The yard is filled with pop-up stands, full of craft jewelry for sale and artisan coffee brewed with water heated to a precision 90 degrees. The fenced area includes a greenhouse, a miniature botanical garden, plus a small herb garden and composing centre. Way behind the side of the building is a beehive, where Houston Makerspace’s honey comes in from a 3 mile radius or so (when the last batch was last available, it sold out within a single day). The building itself is an old warehouse, with I-bar ribs and canvas lining the roof. Right inside the bay door, a DJ station pumps out grunge and indie hits. Just ahead is the office, where you can get your very own $20 HMS T-shirt, and past that, the classroom with its colour-matched chairs, festooned with ancient maps. A break room is set up between the classroom and printing shop, with a mini-fridge and an urge to label your items inside, lest they get tossed or composted. The print-shop is huge, with screens on articulated merry-go-rounds, a large vinyl cutter, and a massive conveyer-belt heater to get those patterns set fast! Another corner and you’re in the jewelry shop – the first one I’ve seen in this tour – with workstations set around lenses and fine-motor skill tools and tweezers. It’s fully equipped – there’s even a rock tumbler on hand, if you want to turn any random stone into a thing of beauty! Getting out onto the main floor, there’s huge areas dedicated to woodworking and metalworking, plus the ceramics studio, right by the other side of the office. Some lined-off areas in the corner are studios, rented out by the space to particular artists, who toil in secrecy, trucking in sculptures and the like. 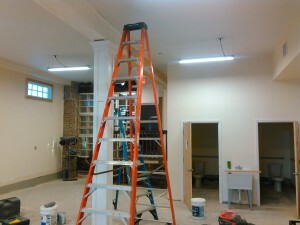 The space also rents out co-working desks in the loft over the downstairs craft rooms. Many a cottage industry has started here, after a class or two on making-your-own crafts. HMS is centrally located within the Metro, and most of the regular events are conveniently away from the peak traffic times. Of the two big spaces in Houston, this is definitely the one with the artistic crown. If you like working with your hands and having good vegetables, coffee, or beer, this is the chill place to do it. In Spring, Texas, just off the I-45 “North Freeway”, there’s a small business park that’s kinda hard to turn into. Sandwiched by chain link fences and between two other places, it’s hard to spot at night. If you miss it the first time, it’s maybe two clicks and a U-turn to get around to the same one-way frontage that approaches the correct driveway. But when you reach the fenced, corrugated-steel complex, you’ll find the Proto Makerspace on the front side of the second building. It’s labelled “2D” but it’s hardly flat – this facility has two stories! The more spacious upstairs is where everyone hangs out. There’s a laser cutting station that overlooks the parking lot, with a homebuilt SDR flight tracker perched on the windowsill. Behind this is the main area, the combination classroom/theatre/gaming lounge. This is where the kids come to learn – the space runs day and weekend classes, and better-than-summer-school week projects. One upcoming course is on how to program, with the help of Scratch, Minecraft, and a real live NASA engineer! In addition to the structured approach, ProtoMX has a junior maker club option for aspiring digital artists, that keeps the clean-room tools open for exploration. It’s not every space that strives to be this inclusive! Past the motion equations scrawled on the whiteboard, the theatre/gaming nexus is dominated by a PlayStation 4, a stack of games ready to play, or perhaps spool up Netflix and step over to the kitchen and fire up the popcorn machine! Thirsty? The beverage of choice is Coke Classic, often with Barq’s or Dr Pepper in the fridge too for a half-dollar donation. Open house night might just occasion an order of Papa John’s Pizza, with the brownie, or if you’re hours-long into your woodworking, it’s not hard to fix something simple between the microwave, keurig, and electric kettle. Among the more fascinating additions to the food arsenal is the multi-syringed PancakeBot, complete with griddle, coming to a fundraiser near you! Rounding it all out is the studio space for photography and screen printing. There’s a computer set in the middle side room, also host to the comfiest couch in the space, and 25 member storage cubbyholes. The last room, tucked into the corner, hosts the 3D printers: fast MakerBot clones, churning away, plus a marginally functional Black Devil Delta. They’re in the middle of printing iPhone adapters for the reflector telescope. The telescope (salvaged – you wouldn’t believe what people just throw away!) is observing the waxing gibbous moon. The aim of its laser-cut stand has to be adjusted every other minute as the moon crosses the sky. Two versions of the adapter come out of the printers, one for each kind of iPhone the members have in hand. Amazing photos come out until the first adapter snaps, then the other phone comes in with the other adapter, working even better with its HDR capability. Between an unsteady hand and immutable autofocus in the camera app, my own phone fails to capture anything useful through the objective. But in principle, given an hour or so and a set of calipers, suitable precision mount could be had for anything with a lens! If you’re worried about traffic – and practically everyone in Houston is – Proto is a great bet if you live on the north side. I’d give ProtoMX the edge over all of the others on gregariousness, along with being a little more artsy and definitely more STEM-outreach focused than average in the Metro. It’s also open more and better-equipped than the other small spaces. They’re the first and last space I visited in the Houston area. All in all, a solid shop! San Antonio de Bexar is the nexus of Texas history. The original Texian Flag flew over the Alamo – not much more than “COME AND TAKE IT” scrawled on some linen. The intersection of Roosevelt and McKinley sounds straight out of another era entirely, but you turn a different century walking into this white building with glass doors and white-painted pattern brick. A modern phrase might be “Come and Make It” – 10BitWorks’ motto. This old Harley-Davidson chopper shop, from the bare concrete floor to the tar-paper roof, is bustling with the grits of the 21st Century, a digital factory replete with robotics and aquaculture expertise. Walk in the door facing McKinley, and you’re already in the woodshop. Though all the limited parking is on the far side of McKinley, it’s a bit of a short circuit to start out; the main entrance is still on Roosevelt, which opens directly to the 3D Printing and Laser area – where everyone hangs out. The tour commences from this door, running past the gallery, the storage space, roaming from the clean machines to the dusty woodshop, then into the classroom, which doubles as the arcade and kitchen. Already, there’s great history here at 10BitWorks. Aside from offering the first 3D-Printed Fiesta Medal to San Antonians, or assisting local groups that laser-print portraits on tortillas for February’s Luminaria, they once got an OLPC XO-1 from Josef Průša himself, following an education conference in town. Starting as a club of just 8 members, 10Bit (always numeralled, never spelled) has grown to around 30, and there’s plenty of room still. The new President of 10BW is interested in cultivating a larger, more active membership, even pondering a mini-tour of Texas Makerspaces to figure on best practices. Laser Cutting is always a big draw. Right now 10BW is still trying to nail down just how they want to do the accounting. Technically, the Laser Cutter is still more of a partnership between a few members. $1.75 a minute is up there, but most spaces aren’t offering an 80W laser, either. Eventually that gas tube is going to break, so the rate needs to be self-sustaining. Finding that happy medium, that keeps it busy and paid for, is a challenge. Growth is also part of the plan with the brand-new 150-gallon aquaculture system. It’s stocked with culture medium, earthworms, and tilapia fingerlings, and is just about ready for a first crop of heritage vegetables. Amazing what you can do with a little elbow grease, a pump, an aquarium heater, and 5000K LED lightbulbs! Tuesday is the day for expert advice on 3D Printers. Quite a few folks are working on a build or tweaks, most of them are cartesians based on “GRAMPS”, the first fully-functional model the space bootstrapped. Someone’s next printer, plus or minus some refinements in Unigraphics, is coming out on a bed already, while one of those fancy “digital sundial” models is coming out on another unit. The extruders must be pretty good here, I see a lot of ABS running with just a heated bed and no walls. My rig struggles to keep up. I’m also still using Painter’s tape on my bed; here the conventional way is a little hairspray on a PLA printbed, or a spritz of ABS “goop” made with strings of your filament and a little nail polish, to get a good level stick to the print bed. Wednesday is the art day. The big project is laser-cut jigsaw puzzles, which run into a few snags along the way. On Saturday, an early batch caught fire on the 80W Rabbit. Thankfully the worst of it tonight is that they smell a little, between the burnt fiberboard and cinder-edged photopaper. The end result is a smart-looking 6 piece puzzle, enough to show off, maybe get someone interested in the technique, or at least admire the artwork. The photos for the next batch pop out fast from 10BW’s HP OfficeJet Pro 8610, and don’t look half bad at all! Another notable art piece is from last year’s President, an engineer and part-time artist, who has for the last few years mailed a Constructable Ornament as a Christmas Card, adorned with six self-made original paintings, printed into a flat that can be folded into a cube, taped down, and hung on the tree! This year’s version has a handy folding 3D-printed plastic backing cube to make it nice and study. Thursday is mechatronics night, where bit by bit, the space’s InMoov Android is being printed and put together. It looks like a harlequin quilt of 1990s aspiration, rising out of the gallery table slowly, each piece a random colour. Eventually the whole thing will stand and be motorized; as a demo, there’s a red finger printed out to greet guests at the entryway to the space, but it’s a bit wonky, albeit in a fun way, and hardly ever plugged in these days. A few of the operational InMoov units are done up specifically in one colour, but why not do something that pops out? Saturdays are the official Open House Day, and the members tend to get an early start, though nominally it begins at 1pm. With all day to dedicate to the cause, you’ll find everything from DIY aluminum casting with lost PLA, bentonite-sand, and a wooden form box, to delicious frosted sugar cookies made with a 3D printed cookie cutter, with yet more cookie shapes coming down the pipeline for next week, along with general 3D printing and the occasional visitor stopping by to try out the laser. San Antonio is, to put it lightly, not a bad place to eat. A maelstrom of menu choices surround the space; the top of the list is Whataburger, located barely a block away (just watch out for cars speeding around the blind corner). Another popular choice is Bill Miller BBQ, a bit farther down the way. And there’s taco trucks everywhere! Of course, I’m a sucker for nostalgia, so I make a special trip across town to the neon fifties of the In-N-Out Burger, the last one I’ll see on this trip after passing it up in Dallas and Austin. I have friends in Vegas who still are shocked that they’d ever open a second distribution centre. Ah, but this is getting a bit off the beat, now! Basically, if you like robots, if you like laser cutting, if you like burgers, you’ll love 10BitWorks. The drive from Plano to Arlington is a bit daunting – they don’t call it a Metroplex for nothing – it proves to be a round-trip voyage of about 110 miles, past the original Six Flags theme park and the giant AT&T Stadium, home of the 4-and-11 Dallas Cowboys. The University of Texas as Arlington is located just south of downtown, where free 2-hour parking isn’t so hard to find. Still, it is a bit of a hoof deep into campus, past the Engineering Quad and the maze of other buildings to the central Library, the home of the UTA FabLab. Like in Tulsa or Oklahoma City, it’s open to the public, though have your Driver’s Licence ready; the library makes you stop at a check-in desk. The creative space is tucked into the southwest corner of the first floor, just off to the right of the entrance. A large wheeled whiteboard serves as the OPEN/CLOSED sign for the space. It’s a little bit before noon, well into the swing of things; the board’s OPEN side is invitingly facing your way, between a few scattered study desks, though beyond a certain point off to the left, there’s just bare tile floor. Today, the entire south side of the building past the FabLab is ripped apart and cordoned off with black plastic sheeting, clearly for some impending renovation. Nearly a dozen people buzz about the well-used facility, the printers chugging away, and the vinyl and laser cutters are seeing steady use as well. Daylight streams in abundance through the south-facing windows; so many shop floors are enclosed, and wholly lit by fluorescent tubes. This is easily the brightest space I’ve yet seen. Clever stickers and galleries of past works abound. Machined designs of all types, from building models to functional object lifts, printed as a whole piece. You even have your choice of material to ape that famous Vapourwave album cover from Macintosh Plus, “Floral Shoppe” — available in your choice of rustic wood veneer or wispy traces in glass. Welcome to the future! The equipment is all the standard FabLab fare, though they have a sewing machine as a bonus, plus a little extra in the way of 3D scanning; There’s a static unit suitable for small objects, or a handheld 3D Sense “wand” that can capture human sized objects – like, say, a bust! You have to stay pretty still, and the optical pickup doesn’t quite deal with glasses. But there it is, 15MB of me! Turns out, it’s actually a very auspicious time to visit this lab – over the next few weeks, half of the Library’s first floor will be renovated into the Fab Lab Expansion – home to all the woodworking and metalworking equipment they don’t yet have. Along with this, a second laser cutter is going into the southwest corner, right next to the existing one! As the lab grows, they’re contemplating adding a membership fee, but they have a commitment to keeping the space open to the public – the exchange of ideas is important to the health of any creative space, after all. The FabLab isn’t just for making cool doodads, though. There’s serious research going on here, too! My tour host has actually been working on a Master’s Degree and is now starting on a Ph.D, all deeply related to the FabLab and its manufacturing technology. Of course, when you write your thesis and go straight into your dissertation, it’s not sent straight out, it’s on hold pending the rest of the work. So you’ll have to come back in a couple years to get the full white paper on the UTA FabLab, but you only have to wait until February to check out all the cool new stuff! On Tuesday, the sun began to shine again over a rain-soaked Oklahoma City, just the thing to bring out the bright colours of the Rose State College Health and Environmental Sciences Building. Its blue and gold veneer faces Interstate 40 just off Tinker Air Force Base. A column past the grand carport holds up a glowing marquee inviting passersby to register for Spring Classes at this “military friendly” community college. Veering off I-40 presciently before this display, or perhaps backtracking circuitously from Southeast 15th Street, where Google and the campus newspaper say Rose State is, one may find this building’s parking lot, sunk into the ground just out of sight from the cross street. You’ll have to drive through a couple other lots to find the large banner strung across the rear entrance of “HES” announcing the location of the FAB LAB at Rose State College. Entering in the automatic double-doors, you find the foundry just to the left, announced by bright acrylic panels stuck to the wall, its double doors angled to face both the entryway and the passing hall. The computer lab ahead is also part of the space and the restrooms are just to the left down the hall. As soon as you enter, you see the entire World to your left, brought here via webcam and a big-screen TV. (Europe isn’t awake right now.) You can pantomime, draw, or fiddle with the remote until the microphone works, and trade questions with the other FabLabs – “Do you speak Portuguese?” Moving clockwise, the Laser Cutter, the Mill, the Moulding station, the vinyl cutter, the T-Shirt press, the Makerbots, and the in-house design lab. At each step, my host shares insights into how the membership has been uses each to benefit students and the community. For laser-cutting, the materials of choice here are cardboard – in vast supply, donated from a restaurant – and acrylic, which holds a sharp edge without mess or fumes. Various cardboard structures are placed upon the space’s Christmas Tree, topped with a star-like ball made of 30 well-styled sigmoid curves. Tour groups of schoolkids get to build their own papercraft butterflies and pterodactyls, just like the ones flying under the tile ceiling. Starting with the files from Thingiverse, taking them through 1-2-3D Make, and finishing with laser-cutting and assembly. Another cornerstone of the lab’s toolbox is cast moulding, the simple joy of being able to copy objects! Imagine having a precious family heirloom, like Grandma’s ceramic turtle. A layer of silicone, a layer of rubber, then set in some liquid plastic, and now all the aunts have a copy! Or cross the streams – combine a lasercut acrylic or 3D printed master, and cast as many decorative chain links or Commander Shepard Paragon Points as you like, no need to do them one at a time on the slower machines. Of course, the 3D Printer can build parts that cannot otherwise be cast or cut – for example, the NASA socket wrench recently designed to replace a part on the International Space Station! Not satisfied with bland squares and hexes inside these 3D parts, the lab has a certain fondness for changing their infill pattern. One build is filled with tessellated cats, another with sharks! It’s showy – when you print in an opaque plastic, you’ll only see the pattern until it’s sealed off. But who needs practicality when you have fun? When it comes to building or refining concepts, the staff is very eager to assist area makers; Community entrepreneurs have prototyped a few inventions at the space, and there is also a fair bit of academic interest in the facility, especially from a medical perspective (handy being in a health building!). Along that line, it’s being used to build prosthetic arms and there’s an edgy project to model tumours inside brain tissue, there’s all those sticking points with data ethics and privacy of MRI scans. More practical is the service the FabLab provides the local facilities staff, replicating hard-to-find or out-of-production replacement parts, things like window clips or ceiling light mounts. And as a bit of fun, the lab has made Oscar-like statuettes for awards events, it is Oscar Rose State College, after all! They feed the MakerBots with PLA and the uPrint with Stratasys ABS and support material. in the eternal back-and-forth between Painter’s Tape and Kapton, there is no contest here. 50mm rolls of Blue Painters’ Tape does it all! Rolls of it sit everywhere in the facility. Use it on the 3D Printers for a stick-free build, use it to cover the seam of a casting, and naturally you can even use it as tape! They try to keep food out of the lab, it’s not exactly the sort of place tor heavy collaboration over lunch or dinner. Still, every now and again, the go-to crowdpleaser is Hot-and-Ready Little Caesar’s Pizza, fetched as carryout from the nearby location. There’s nothing in the way of woodworking, though there are other campus shop spaces where that’s possible. This Lab is in a Health Science / Environmental Science building, and a bunch of sawdust everywhere would be hard to manage. The space is safer and more accessible with a clean room design. In Tulsa, I had mentioned that FabLabs are often limited in their reach. Yet here is an academic institution getting it right, in my book, by being open to the community as a whole, and certainly not shy of doing a tour on short notice. They’re working on getting the space integrated into more of the engineering and technology coursework, to help familiarize people with what they can do here, and get more Rose State students excited and invested into the space. It’s definitely worth the hike from the middle of campus, or from anywhere in Central Oklahoma!